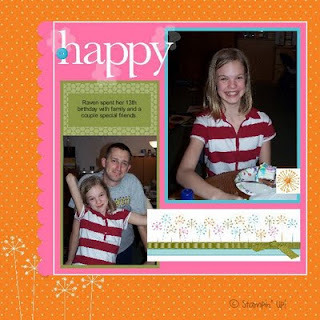 Here is my very first attempt at digital scrapbooking... I'm not a scrapbooker by any means. The whole idea intrigues and overwhelms me. I have three children who's ages total 32 years in all... That's intimidating for anyone. Now I'm sure, that is exactly how you should not look at the idea of scrapbooking at all; nonetheless, that's exactly what goes through my mind... 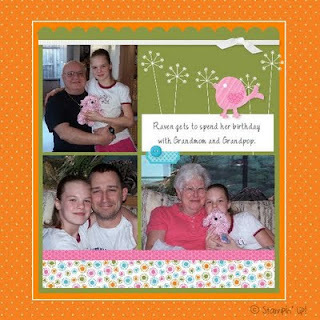 So when the talk of a digital scrapbooking program from Stampin' Up! came up, I was really excited. You see, I love the computer and I could tinker on it all day... So, I thought it would be a great tool for me to start getting caught up. This is a layout for Raven's 13th birthday (yes, last year)... I was the one taking the pictures this time, so she has memories of Daddy, Grandmom and Grandpop. I guess I shouldn't feel slighted, Sierra and Keegan aren't in the pictures either; although for a completely different reason. Raven doesn't always get along with her brother and sister. Maybe later in life... I'm trying to be patient waiting for that. Until then, we have these good memories.